Movie-goers in India can now enjoy the adrenaline rush of the movie scenes as their MX4D seats rumble, tickle or nudge and the side walls theatre throws out snowflakes, rain drops, fog or bubbles. Taking the brand promise of 'LIVE the MOVIE' to an all new level, INOX has opened India's first MX4D® EFX Theatre at the existing INOX multiplex at Inorbit Mall at Malad in Mumbai. 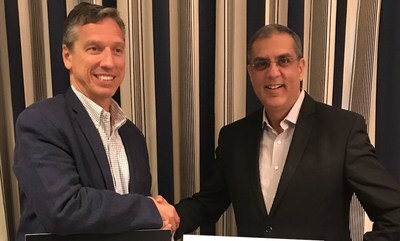 The roll-out of India's first MX4D® Theatre was announced on the sidelines of ongoing CinemaCon, world's largest event for the movie theatre industry taking place in Las Vegas from 1st-4th April. MX4D®, MediaMation Inc.'s newest evolution in the 4D cinema experience, provides a totally immersive environment, where the viewers can 'feel' the action on the screen from the built-in motion and effects in the seats and theatre walls and enhance the movie experience. The theatre seats will move in sync with the movie action and special EFX generators in the cinema, allowing one to 'feel' the movie's motion, jolts, pokes, wind, water and even scents. The in-seat features like neck-tickler, back poker, air blast, water blast, seat popper, rumbler, leg-tickler etc. along with the theatre's atmospheric interventions like snow, fog, rain, bubbles, strobe and scent will leave the audience enthralled and spell bound with the flawlessly synchronized timing of each effect. "Thanks to this innovative technology, our patrons will now be able to feel and immerse in every act of the movie. With the precisely programmed MX4D® effects, each shot would be far more engaging and entertaining. We have been making constant endeavours on the technology front to elevate the cinematic experience and strengthen our association with our patrons. We are delighted to add one more cinema format to our plex at Inorbit Mall in Malad, Mumbai," said Alok Tandon, Chief Executive Officer - INOX Leisure Ltd.
Howard Kiedaisch, CEO MediaMation and Luxin-Rio International, added, "It's truly fantastic for MediaMation to be working with such an innovative and customer focused exhibitor like INOX. Their commitment to delivering a stellar experience for their patrons makes them the perfect partner to bring our MX4D solution to India." INOX Leisure Limited (INOX) is amongst India's largest multiplex chains with 139 multiplexes and 574 screens in 67 cities. INOX has redefined movie experiences in India making it truly a 7-star experience. Each INOX property is unique with its own distinct architecture and aesthetics. Beyond the normal screens, INOX also has INOX INSIGNIA for the discerning audience or KIDDLES for young patrons or MX4D® EFX Theatre for an immersive experience at select locations. INOX brings the very latest in projection and audio technology with INOX Laserplex, IMAX & INOX ONYX. Some of the key multiplex features include plush micro adjustable leather recliners with a butler on call facility, gourmet meal choices by celebrity chef, designer staff uniforms. For easy and convenient ticket booking, INOX offers online booking on http://www.inoxmovies.com and through its smart phone applications across Android and Apple platforms. For nearly 30 years, MediaMation, Inc. has provided innovative technological solutions to the Cinema and Themed Entertainment market and has expanded to the esports industry in 2017. MediaMation is an interactive technology company and a worldwide, leading supplier and manufacturer of patented technology for 4D Motion EFX theaters and seats, including its MX4D Motion EFX technology, with over 300 cinema installations worldwide. MMI also designs and implements turnkey creative solutions for complex shows, rides, exhibits, fountain shows, etc. for theme parks, zoos, aquariums, museums, cinemas and FECs.